The Robertson Patrimoine Group, a subsidiary of Desygn Investissement, is a wealth management firm resulting from 16 years of experience of its founder Stéphane Robert in International Wealth Management between Miami, Barcelona, Paris and Mauritius. As a property developer firm approved by the BOI (Board of Investment) of Mauritius, we specialise in the buying and selling of luxury properties, real-estate investment, construction and real-estate developments on the local and international markets in Mauritius. What services does Robertson Patrimoine Group offer, and what makes us different? With the approval of the Mauritian government, we commercialize many real estate projects (RES, IRS, PDS) corresponding to an international clientele. Our company manages and supports its clients before, during and after their investment. We take care of all the administrative part, as well as the sale or the long-term rental management of a property WITHOUT ADDITIONAL FEES. 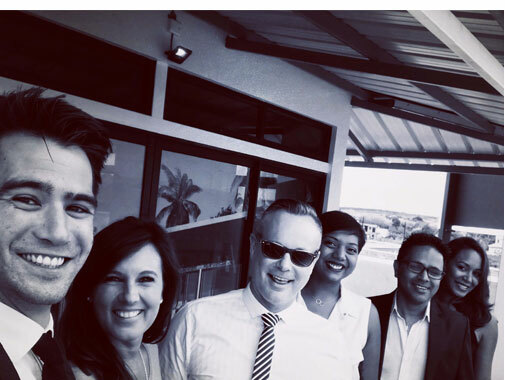 Thus, our clientele is not confronted with all the administrative procedures to be accomplished during an expatriation or a long stay in Mauritius and avoids excessive fees by passing through third parties. A unique service that no other company offers to its customers here. Groupe Robertson Patrimoine OFFERS a management service, therefore FREE, to our investor clients and the agency fees following their acquisition are not to their charge. Rental management is a no-cost service that we offer to investor clients wishing to rent their property purchased from us. The agency fees are valued at a month's rent for long-term rentals. What are the advantages of investing in Mauritius? Investing in luxury real estate is one of the safest investments to create a sustainable heritage to pass on to future generations and it is all the better if the investment is made in a country that fiscally benefits the investor. Mauritius is a country ranked among the top 10 in the world in terms of peace and economic success, and the country also applies an attractive tax policy that offers several advantages to the foreigner willing to invest in Mauritius. Investors in Mauritius are not subject to the various residential taxes and other taxes on property and income that would otherwise be taxable if the financial investment had been made in his/her country of origin. See Advantages of investing in real estate in Mauritius. What are the types of investment in Mauritius? Mauritius offers excellent opportunities for business in different sectors approved by the BOI (Board of Investment) of Mauritius and investments in real estate development remains the most reliable and secure investment for its sustainability in addition to being a booming sector. See our properties available for investment and immediate acquisition in Mauritius. Who can buy real estate in Mauritius? To promote foreign investment in Mauritian Real Estate, the Mauritian government has introduced the PDS (Property Development Scheme; in replacement of the former RES and IRS), which regulates the construction and sale of villas and apartments accessible to foreigners for purchase. These properties come with associated services for an exclusive comfort and in phase with the surrounding landscape. Foreigners holding a resident permit in Mauritius and foreign investors (all nationalities), as well as companies registered as foreign companies and qualified management companies approved by the Financial Services Commission, are eligible for PDS real estate purchase in Mauritius. How to become a resident in Mauritius? 1. Buy a PDS / RES / IRS property that makes them invest in Mauritian real estate accessible to non-citizens. Permanent residence is granted for an investment of more than $ 500,000 USD, including spouse and children up to 24 years of age. 2. Settle into retirement in Mauritius if they are aged 50 years old minimum, after meeting the 3 years B.O.I criteria while respecting the terms of stays on the island and under certain financial conditions. 3. Invest in one of the different business sectors open to foreigners and satisfy the requirements of the B.O.I following this investment to obtain the Mauritian residence. In addition to its tax advantages the Mauritian real estate, which is open to foreign investment, remains one of the most reliable and profitable investment sectors without the years of expectations or the turnover to be met in order to obtain permanent residence in Mauritius. What are the real-estate properties that Robertson Patrimoine offers? The Robertson Patrimoine Group is positioned as the leader in Mauritian prestige real estate with luxury properties for Mauritian citizens and villas, apartments and prestigious residences under the Mauritian real estate investment schemes accessible to foreigners/non-citizens. You can see our properties available for off-plan investment and immediate acquisition here. What is the off-plan investment, and what are its benefits? Real-estate investment in Mauritius is similar to what is practised in France or elsewhere. The off-plan is a common term for real estate purchase under Sale in the Future State of Completion and allows a gradual unlocking of funds, in line with the progress of the works and this until the handing over of the keys. It is also possible to buy an already completed property that is accessible to foreigners. How long does it take to buy an apartment or a house in Mauritius? Count one to two years before being able to move in an off-plan purchase and between 1 and 3 months for an already built property, depending on the acquisition procedures and obtention of the residence permit in Mauritius. Am I obliged to stay in Mauritius all year long to benefit from the Mauritian residence and the fiscal policy of the country? 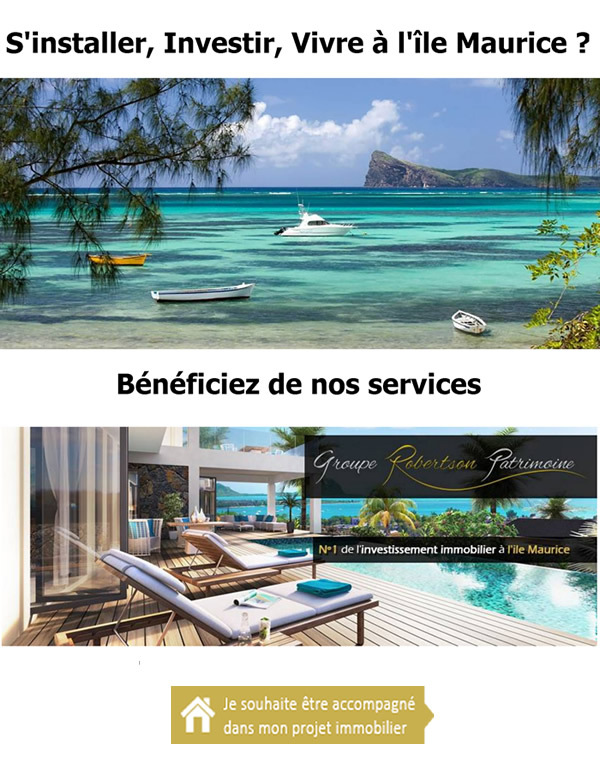 To benefit from the Mauritian tax residence after acquiring the residence permit, it is advisable to stay more than half of the year in Mauritius and to have justified centres of interest (Telephone subscription, internet line, ... ). Thus all your income generated in Mauritius will be taxable only in Mauritius at a single rate of 15%. Can I rent my villa/apartment PDS/ RES/IRS while I am away from Mauritius? The rental of your Mauritian property during your absence is part of the various means to increase the profitability of this property. The Robertson Patrimoine Group looks for tenants in your absence. For what type of property? What type of mortgage? Can I get help, a tax credit? To invest in Mauritius with a loan, you should apply for financing through a Mauritian bank. In general, French and European banks are reluctant to allocate credit for an investment outside the eurozone. No tax credit is available. On the other hand, property acquired in Mauritius is not included in the calculation of property taxes in the investor's home country. What is the amount of my personal contribution? The amount of the personal contribution will depend on the amount of investment envisaged, and the desire to make a credit or invest with own funds. What is the compulsory insurance? For the purchase of a property in Mauritius: Home insurance including the clause of compensation in case of a cyclone. For the rental of a property: home insurance including the clause of compensation in case of a cyclone. What is the cost of notary fees? Notary fees amount to 1.15% of the value of the property. The costs of the B.O.I (governmental body regulating foreign investments in Mauritius) are 25 000 US dollars or 5% of the acquisition value. What are the additional costs for the owner? No other expenses following the purchase of a Mauritian property except the ancillary costs resulting from the will of the purchaser: furniture pack, decoration change etc. How many years do I have to keep the real-estate property purchased before reselling it? Do I have to go through a real-estate agency? No. The Robertson Patrimoine Group is a wealth management firm that provides rental and resale management services to its clients at no extra cost, excluding agency fees.